Salt absorption is a relatively rapid event taking perhaps 15-30 min for curd chips of Cheddar cheese, ~7.5 h for Camembert and perhaps 15 d for Parmigiano-Reggiano. After NaCl is absorbed into cheese curd, there then must be established a salt equilibrium across the cheese mass. In dry-salted cheeses, true equilibrium is rarely is ever fully achieved and substantial intra- and inter-block variation in NaCl distribution are common for Cheddar. NaCl equilibrium is established quickly within each curd chip but there is poor transfer of NaCl across the chip boundary. 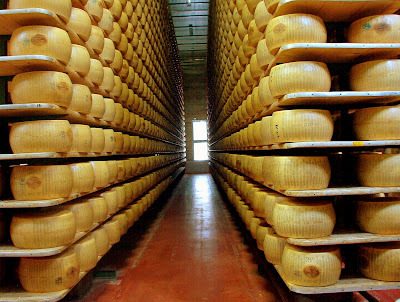 In brine-salted cheeses, however, there is initially a very large NaCl gradient from the outer portion of the cheese towards its centre; attainment of equilibrium is very slow indeed, taking up to 10 months for a large wheel of Parmigiano-Reggiano. Guinee, T.P. and Fox, P.F. (2004). Salt in cheese: physical, chemical and biological aspects, in Cheese: Chemistry, Physics and Microbiology, Vol. 1 General Aspects, 3rd edition, P.F. Fox, P.L.H. McSweeney, T.M. Cogan and T.P. Guinee (eds), Elsevier, Amsterdam, pp. 207-259.